Detan Honding and his faithful sidekick/mechanic Tibs are in trouble, as usual. Their flier needs major repairs, leaving them stranded in the selium rich mining town of Aransa in the Scorched Continent which is as dried out as its name suggests. In this post-apocalyptic world, selium is the major source of energy and power. There's one drawback: only those born with sel-sensitivity can trace it. Regardless of rank or wealth, any person found to posses the gift is obliged to work in the mines divining new selium to harvest. Citizens look the other way, but these people are nothing short of slaves to the selium mines, and life expectancy is short owing to the combustible nature of the gas . Due to the recent murder of the town's warden, Honding and Tibs soon discover that, with their checkered pasts, it's not a good time to be stuck in this particular part of the Scorched Continent. The local authorities, headed by watch captain Ripka Leshe, have enough trouble on their hands tracking the murderer; a suspected sel-sensitive or doppel, who can manipulate selium to masquerade as someone else. Honding's bravado and big mouth quickly entangle the pair in the political machinations of ruthless ex-Commodore Thratia Ganal who will stop at nothing to be elected the next warden. Lethal threats abound and, true to form, Honding devises a risky plan to escape the perilous sands of Aransa by stealing Thratia's prized airship, the Larkspur, right out from under her nose. I liked O'Keefe's cast of characters right from the start. Detan Honding's a complicated mess, which makes him unique and extremely likeable. He's a charming, reckless con man who enjoys mouthing off to authority figures. He's smart enough to know better, but can't quite help himself which often made me cringe and giggle at the same time. I admire the fact that his sense of mischief is never quite beaten out of him no matter what hardships he encounters. Honding's irreverent personality balances the bleak setting of the arid mining town and the grim subject matter of a downtrodden population. Tibs is constantly working to steer Honding out of trouble and is the best kind of sidekick; one who ignores and insults his friend whenever the opportunity arises yet is also unwaveringly loyal. His total disregard for Honding's wishes kept me entertained throughout the novel. 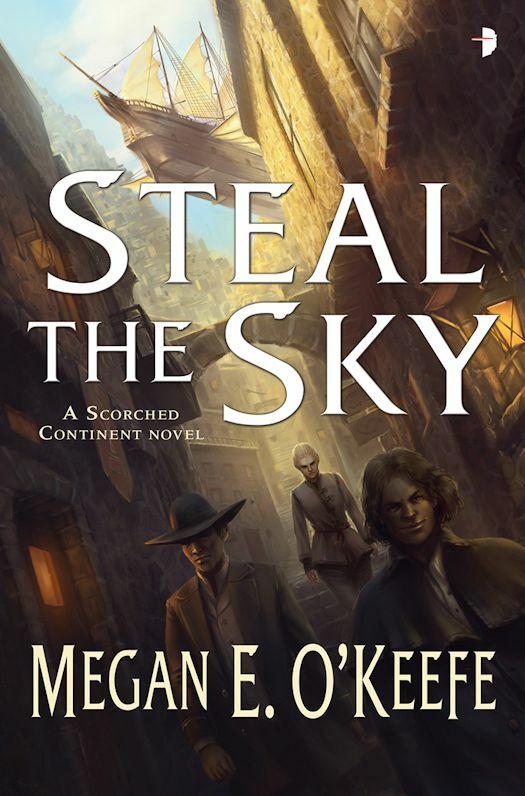 Steal the Sky was not the entertaining romp through a desert mining town that I expected after reading the opening chapters; it was so much more. O'Keefe's debut contains elements of action, adventure, steam punk, and espionage with a hefty dose of social inequality issues that make it an exciting and thought provoking read. Steal the Sky also receives high marks for transporting me to sun baked Aransa. Even though I was shivering in my wintry New England home, I could practically see the heat vapor rising from the hot sand and feel the parched air fill my lungs. Hitch a ride with Honding and Tibs and Steal the Sky; it's a journey you won't forget.